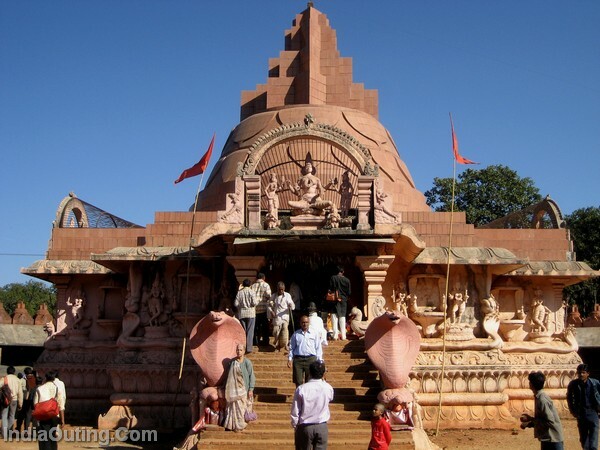 Jabalpur (जबलपुर)also known as shanskardhani is a city in the state of Madhya Pradesh in India. 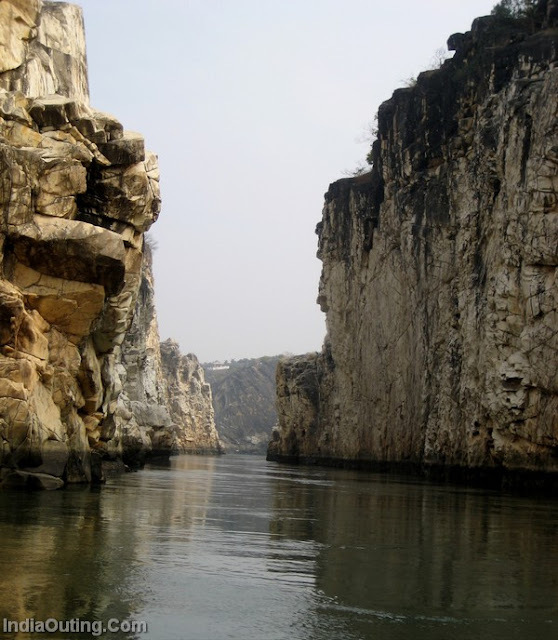 Jabalpur is located in the Mahakoshal region in the geographic center of India. Jabalpur was the 27th largest urban conglomeration in India in 2001 (2001 Census). On a global scale, Jabalpur was the 325th largest city or urban area in the world in 2006 and Jabalpur is estimated to be 294th largest city in the world by 2020. Jabalpur stands 121st in term of the fastest growing cities and urban areas in the world in 2006. Jabalpur is the first district in India who has been obtained the comprehensive ISO-9001 certificate. This has come into force from April 1, 2007. It is also known as Sanskardhani. It is believed that Jabalpur is the tapasya bhumi of a mythological figure known as sage Jabalie, from whom the name Jabalpur is derived. Ashokan relics have been found. Later on it was the capital of the famous Tripuri kingdom in the (9th–10th centuries). In the 16th century the Gond raja of Garha-Mandla extended his power over fifty-two districts, including the present Jabalpur. During the minority of his grandson, Asaf Khan, the viceroy of Kara Manikpur, conquered the Garha principality and held it at first as an independent chief. Eventually he submitted to the Mughal emperor Akbar. From time to time, the Mughal rulers tried to overrun it. The legendary Gond Queen Rani Durgavati also died fighting the Mughal forces led by the great Mughal Emperor Akbar. The Mughal Empire, however, enjoyed little more than a nominal supremacy; and the princes of Garha-Mandla maintained a practical independence until their subjugation by the Maratha governors of Sagar in 1781. 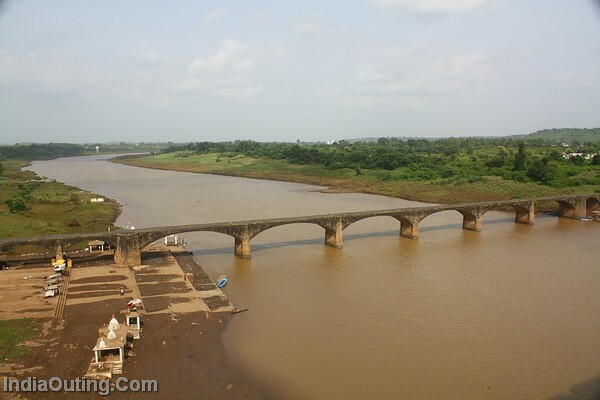 In 1798 the Maratha Peshwa granted the Narmada valley to the Bhonsle princes of Nagpur, who continued to hold the district until the British occupied it in 1818 after defeating the Marathas. 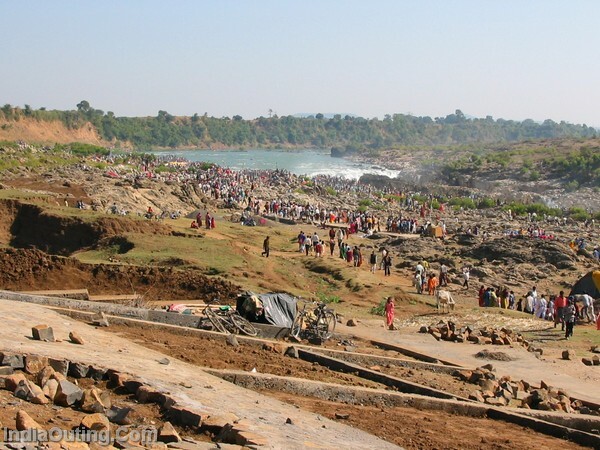 The British made Jabalpur the commission headquarters of the Narmada territories and established a cantonment here. Under the British Raj, Jabalpur became the capital of the Saugor and Nerbudda Territories, which was part of the British North-Western Province. At that time it became infamous for the Thuggee murders, but made more famous by the man who suppressed thugee, Col. Sleeman, who was also appointed commissioner at Jabalpur. The Saugor and Nerbudda Territories became part of the new Central Provinces in 1861 which in 1903 became the Central Provinces and Berar. By the early 20th Century Jabalpur was the headquarters of a brigade in the 5th division of the Southern Army. An important landmark event was the holding of the Tripuri Congress session in 1939 that was presided over by Subhash Chandra Bose. Politically under Lokmanya Tilak’s direction Jhanda Satyagraha was launched with success (who visited 3 times) Mahatma Gandhi visited 4 times and famous Congress session was held at Tripuri (Jabalpur) in 1939 when Subhash Chandra Bose was elected the Congress President against the wishes of Mahatma Gandhi. Methodology of two thoughts to achieve freedom was formulated in the session. A memorial Kamania gate was erected in city. The city has the typical hot and dry temperate of the Great Indian Plateau. 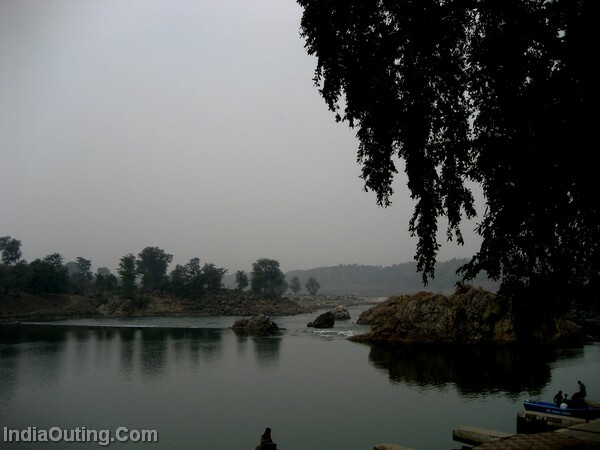 Jabalpur is hot during summers with temperatures up to 47 degree Celsius but the winters are quite comfortable. The July to September months bring heavy rains with the onset of the South Western monsoon. The October to March window during the winters is suitable for a visit to the city. Jabalpur is well connected by air, train and road. By plane: operate daily flights from Delhi to Jabalpur [KingFisher Airlines] have also started daily service To/From Indore. The launch of this new route will also offer enhanced connectivity between Jabalpur and other cities like New Delhi, Hyderabad, Kolkatta and Chennai. 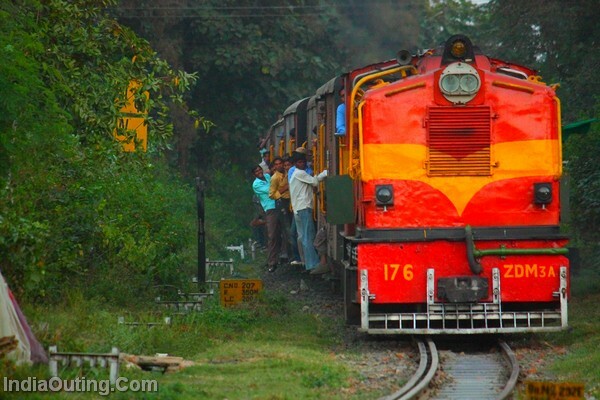 By train: Jabalpur is well-connected with superfast trains and express trains with Kolkata, Ahmedabad, Mumbai, Bhopal, Jaipur, Lucknow, Chennai, Patna, Hyderabad,Bangalore and New Delhi. Airport Name is Dumna Airport.This airport is 7-8 KM from CMM. By car: The national Highway (Varanasi-Kanyakumari Road NH7, Jabalpur-Jaipur Road NH12) passes through Jabalpur and there are daily bus services from Jabalpur to Nagpur, Katni, Jaipur, Gwalior, Bhopal etc. 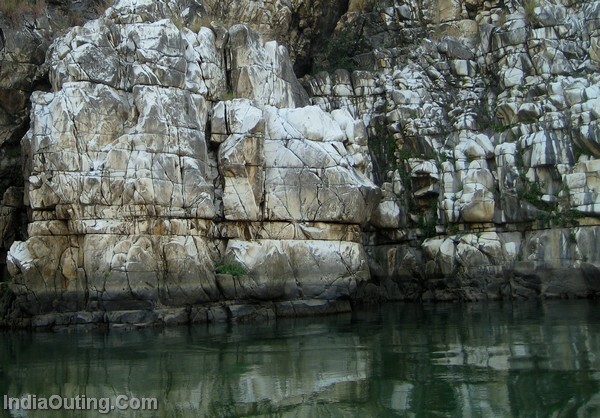 Bhedaghat: Marble Rocks: This small village of Jabalpur district situated on the banks of river Narmada and widely famous for its marble rocks is at a distance about 25 Km from Jabalpur by road. 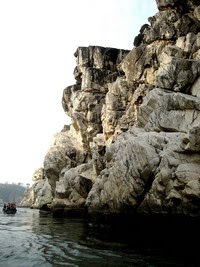 Soaring in glittering splendour, the marble rocks at Bhedaghat rise to a hundred feet on either side of the Narmada. The serene loveliness of the scene is one of cool quiet, the sunlight sparkling on the marble-white pinnacles and casting dappled shadows on the pellucid waters. Sunlight, now glancing from a pinnacle of snow-white marble reared against the deep blue of the sky as from a point of silver ; touching here and there with bright lights the prominences of the middle heights; and again losing itself in the soft bluish grays of their recesses….. Here and there the white saccharine limestone is seamed by veins of dark green or black volcanic rock; a contrast which only enhances, like a setting of jet, the purity of the surrounding marble. 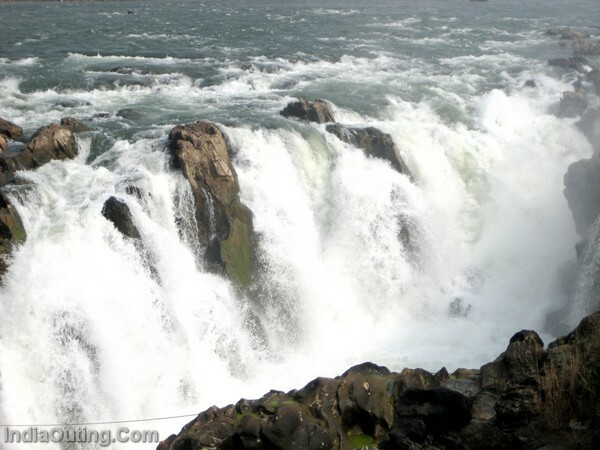 Dhuandhar: The famous waterfall is located just 25 km from Jabalpur. The waterfall is known as Dhuandhar (‘Dhuan’ is the Hindi word for smoke) since the water droplets at the fall go above in concentrated mass and crete illusion of vapours. Chausatyogini (Sixty Four Lady Yogis): Situated atop a hill rock and approached by a long flight of steps,the Chausat Yogini Temple commands a singularly beautiful view of the Narmada flowing through the jagged gorge of Marble Rocks (Bhedaghat). Dedicated to Lord Shiva, this 10th century temple has exquisitely carved stone figures of deities belonging to the Kalchuri period. 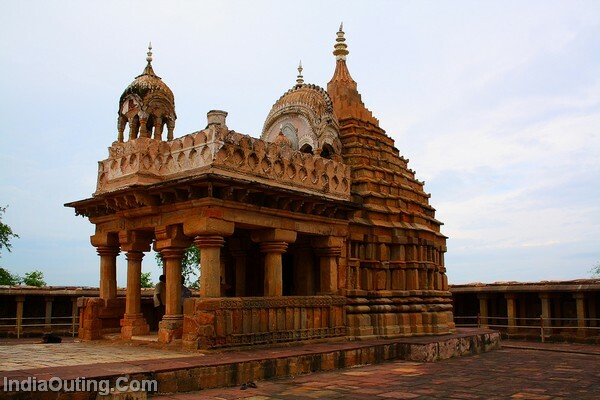 According to a local legend,this ancient temple is connected to the Gond Queen Durgavati’s palace through an underground passage. 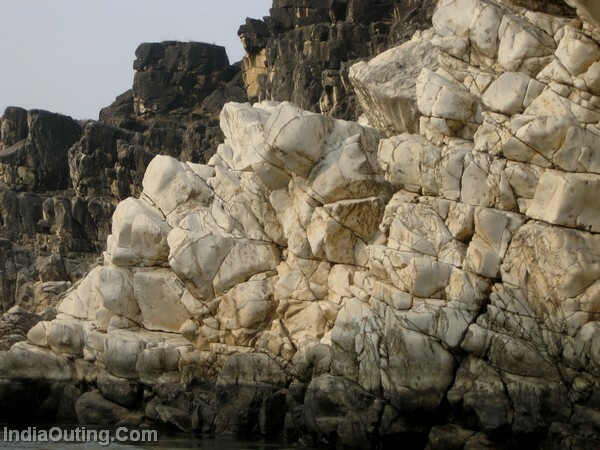 Balancing Rock: Jabalpur is also famous for eroded volcanic rock formations called as Balancing Rock of Jabalpur. Amazingly this rock survived even in earth-quake of mag 6.5. 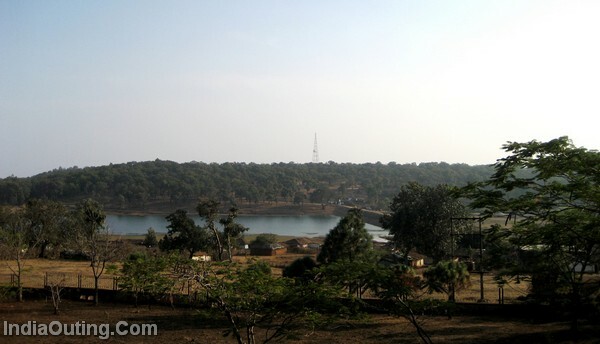 Bargi Dam: It is a multipurpose project on river Narmada. It’s also a tourist spot, recently the local autorities have started a cruise boat which runs on the reservoir of Bargi dam. Rani Durgavati Memorial and Museum: Dedicated to the memory of the great Queen Durgavati is her memorial and a museum which houses a fine collection of sculptures, inscriptions and prehistoric relics. Kanha Kisli national park: Jabalpur is nearest big city to go to Kanha Kisli national park which is one of the biggest national parks in India and has the distinction of successfully implemented Project Tiger, as tiger conservation program in India. Every year the park attracts large number of tourists for watching tigers from close proximity. The park is also the birth place of the Jungle Book by Rudyard Kipling. 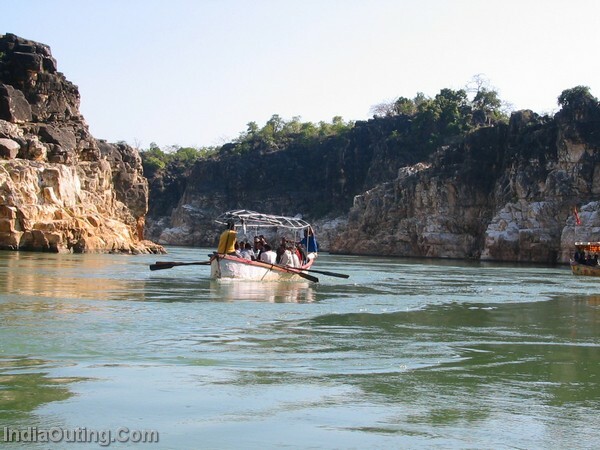 Jabalpur also has ‘Bandhavgarh’ and ‘Pench’ national reserve forest very close by, and well connected through road. Madan Mahal Fort: Built by the Gond ruler, Raja Madan Shah, in 1116 atop a rocky hill, the fort dominates the skyline and provides a panoramic view of the town and the country side around it. Sangram Sagar and Bajnamath: These medieval constructions were built by the famous Gond King, Sangram Shah, between 1480-1540. Tilwara Ghat: From where Mahatma Gandhi’s ashes were immersed in the Narmada, and venue of the open session of the Tripuri Congress in 1939. 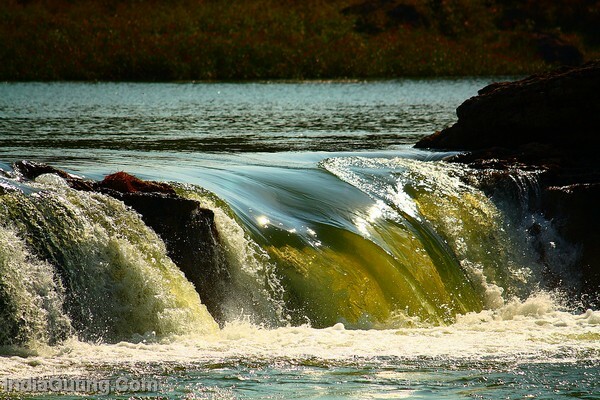 Water Box: Small wild life Reserve and beautiful Dam. hi. it’s good one. thanks a lot for this post. You are running very informative site. Please send me informatio abou Khajuraho. I wish to visit. I am stationed at Surat, Gujarat. GRETA JOB YOU ARE DOING, YOU ARE NOT A TOURISUM MINISTER ARE YOU? It’s really marvelous city, butiful and full of the power of nature created by GOD. Its good, need to visiy once. Nice photo collection good collect able data regarding jabalpur. visiit my company website http://www.technomaxcreation.com to know more about jabalpur. Nice place. Etripinfo.com is one of the leading travel portal for cheap India flights, cheap airfare, online hotel booking and car rental. 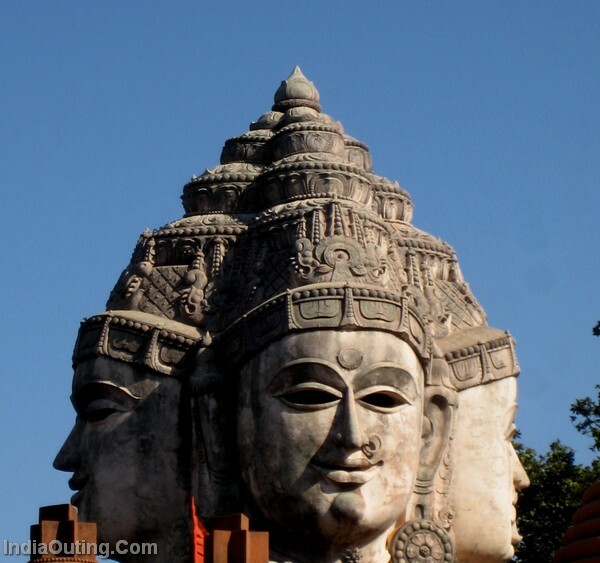 Get cheap INDIA flights to all cities in INDIA for a business trip or holiday. Good! I never knew all that! i know noting about jabadalpur before reading it . it is amazing , realy . Wondeful write-up; thourough and lucid explanation. Excellent pictures. Keep up the good work and may God Bless you for your yoeman service ! really it is wonderful write-up. I appreciate one and everybody who took pains to do this. The photograph and the details are very interesting. I was staying at Jabalpur during 62-65.
quite a few photographs appears to be taken around Bhedaghat but they are without ‘title’. Photographs with title would be more appreciated. 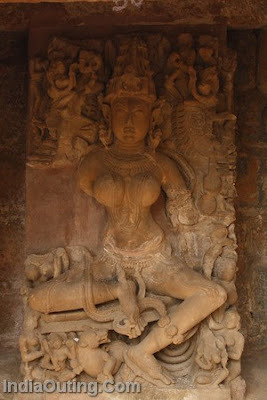 Though Chousatyogini Temple is much neglected, but the sculptures are exquisite. I wish few photographs were there. 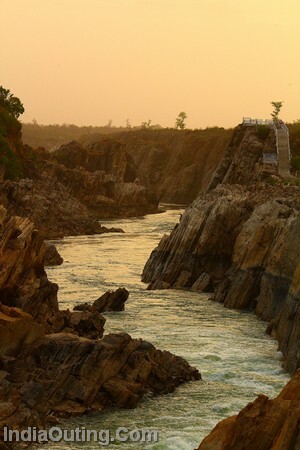 jabalpur is the place where you ind peace and feelnaturalty . 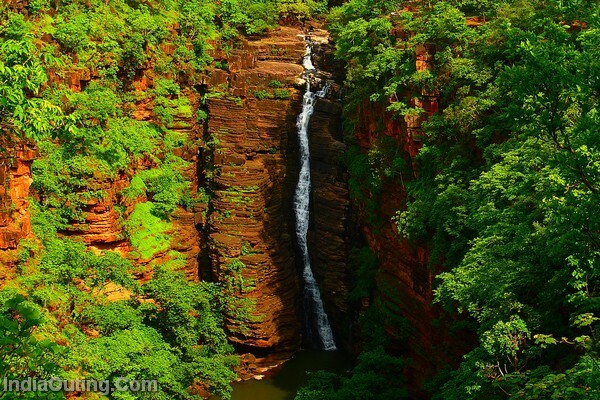 It is very……………….very…………….wonder full images in Jabal pur in madhya prades. Njce place to be visited & will be hundred fold better than my last visit in1981. A place with good educational institutions too. It’s my birthplace, and being born there in Jabalpur it,s very close to my heart, Thank You so much for sharing these pictures. 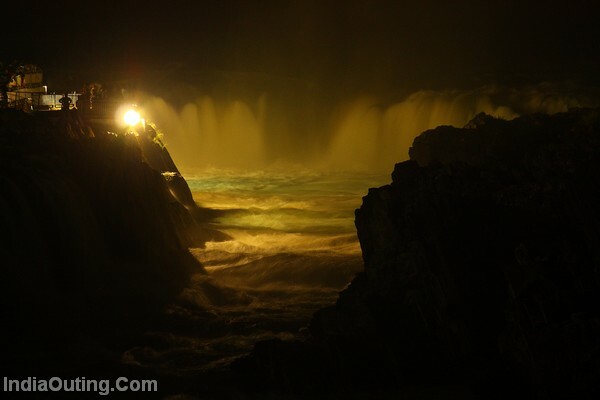 Bhedaghat waterfalls are lovely in the night. I miss my Jabalpur so much!!! i LOVE YO SEE ALL THESE PICTURE’S. 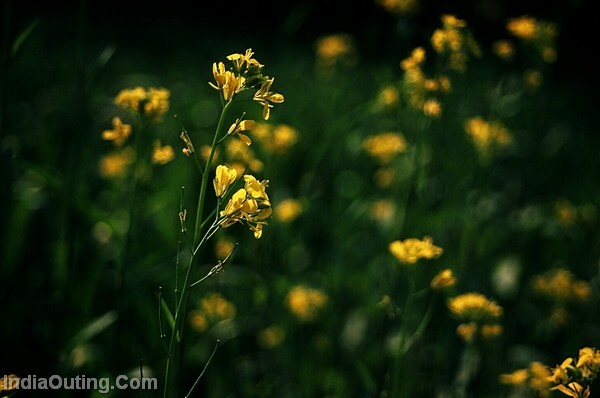 I thought it’s lovely to live at JABALPUR !!!!!!!!!!!!!!!!!!!!!!!! iam also from jabalpur. its realy the city of joy, the city of life.not only nature but persons are too wonderfull of here. love is spreading in the air of this city. spritulity is in soil, thats why osho, yug tulsi pandit ramkinker, maharshi mahesh yogi are the immortel and most enlightend name, who gives the real meaning of this city. you are realy doing wonderfull job by showing beauty of this city. wandar ful mye city jabal pur. 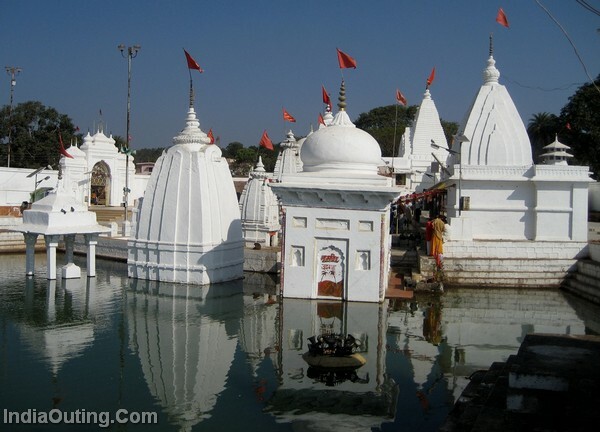 It was exciting to view the website.But u have not shown the birthplace of thegreat scholars whose names u have mentioned in ur site.please let us have a view of their birthplace,since u mention that jabalpur is called Sanskardhani,i.e a conglomeration of good virtues.Please let us know where was Pandit Ramkinkerji born.we would like to visit that place and get inspiration.Great effort. It is absolutely amazing to see how the city of Jabalpur has grown over a period of last two decade. I have lived in this city from 1964 to 1980 before I moved out with my job. Did keep visiting the city till 2005 as my parents still lived there brfore I moved them over to stay with me. The city has been an absolute marvel and is very close to my heart as my entire schooling and college has been from this city. It is extremely heartening to note that the city is growing so thick and fast and tourism is gaining importance. The area around the University campus especially Sita pahad is very scenic, but may not be allowed for photography due to security reasons. The photographs has brought my memories flooding back. I wish I could go back to Jabalpur once more to relive my memories. The pictures are really fascinating. Thank you. by Sleeman. Can you post the pictures? jabalpur is a very beautyfull place..
mai yahan bar bar aana chahungi. hello friend i m also from jabalpur . i love my jabalpur. its so beautiful and clam full place. 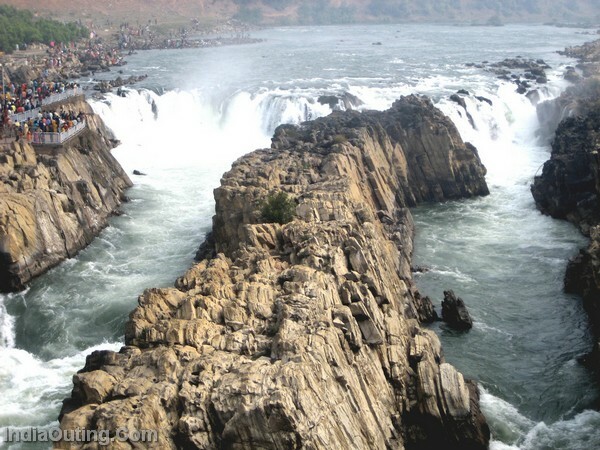 Jabalpur is a cultural,academic,peaceful,green city of central india. I like it. Jabalpur is my dream city. This city give me all of those what i want. I want to “East or West Jabalpur is the Best”. Sanskardhani JABALPUR is an ancient,classical & green city. How nice photoes. Jabalpur is one of the best city in India, every pepole pls visit onse time in your life.thanks.. Going thro this pursuaded me to book my trip to Jabalpur/Bedaghat in feb.2012. Shall give my opinion after the visit. Jabalpur is a very beautiful city i remember my city.